Our goal is simple: we want to provide private hire drivers with opportunity to find the lowest cost insurance on the market. It is not easy to get into the private hire market; according to 2012 statistics from the Law Commission Review, there are more registered drivers than there are vehicles available for private hire and taxi services. One of the biggest road blocks to starting up a private hire company is the cost of insurance. To keep profit margins at an acceptable level, you simply cannot pay extra for your car insurance. 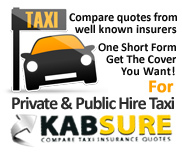 We started PrivateHireInsurance.net to ensure private hire drivers can find the lowest possible insurance policy from a select group of underwriters. Using our website is simple; all you have to do is use the search facility while entering specific details about yourself and you should be presented with a long list of suitable insurers offering policies you can afford. If you have a large number of vehicles you should be looking for discounts from insurers; such benefits could shave thousands of pounds off your annual insurance bill. According to the Department of Transport, there are some 155,000 private hire vehicles in operation in the UK along with 78,000 taxis. With 300,000 drivers in total, the entire industry is worth approximately £1.4 billion per annum so clearly, it is a potentially lucrative business. As one might expect, one-third of all private hire vehicles operate in the London area. Contrary to popular opinion, it is the lowest 20% of earners who are more likely to use either a taxi or a private hire vehicle. This makes sense since these individuals are not able to afford the costs of running their own car. One of the most common complaints amongst the British public is the deterioration of the public transport system. Bus lanes are clogged up, the Tube is packed to the doors and the rail network is becoming increasingly unreliable. In many rural areas of the UK, public transport doesn’t even exist so where does this leave people without the funds to purchase and operate their own vehicle? The private hire industry is a real lifesaver for such individuals as they can go about their daily business without restrictions. In most cases, private hire firms provide reasonably priced transport and are a vital part of the fabric of the nation. Once upon a time, the private hire industry was associated with helping the elderly and disabled while also providing late night transport for partygoers but things have changed. Starting up your own private hire firm is not easy but if you can get past the initial costs and develop a customer base, the profits will start rolling in. The public’s usage of taxis and private hire vehicles has multiplied in the last 25 years or so. In the late 1980s, only around 16% of people used a taxi/private hire service at least once a month; this has more than doubled to 33% by 2013. In the past, the private hire industry was unregulated and it had a rogue element which gave minicabs a bad name. These drivers would pretend to be private hire drivers, pick up passengers and charge them high prices or physically assault them. Thankfully, things have changed and now every firm needs to hold a private hire operator license before they are allowed to accept bookings. All drivers must prove they are ‘fit and proper’ and reputable firms carry out background checks. You also need to have an ‘operating centre’ which is essentially your base of operations. Your home can be this centre but a licensing officer will come around and check the premises. There is an application fee which must be paid every five years and your vehicles are supposed to have an MOT three times a year. You do not have to place meters in your cars and there are no price limits but due to intense competition, private hire firms have to offer low prices. This depends on the licensing authority you are dealing with. If you are planning to develop a large company with multiple vehicles, you have to pay driver, vehicle and operator expenses before you are entitled to the coveted council Certificate of Compliance. This certificate is a legal requirement before taking bookings. We invite you to check out the lowest cost fleet insurance companies on our website as this could save you a small fortune. A private operator’s license will cost several hundred pounds by itself and when you add in the cost of vehicle and driver’s licenses, the price of starting your own private hire firm begins to mount up. As you will be up against a large number of competitors you need to stand out from the crowd. Obviously, offering a low price is an incentive but customers also expect your vehicles to be clean and tidy while your drivers should be well-mannered and punctual. In our experience within the industry, simply having the cheapest fares is not enough if you have rude drivers and battered vehicles! If you intend on using older cars, think again. It is becoming increasingly difficult to get low cost insurance for vehicles more than 10 years old. Indeed, most licensing authorities have now set a limit on private hire fleets. Experts suggest investing in second hand saloons when starting out because they are inexpensive and reliable. Overall, your insurance costs will be one of your biggest concerns when trying to run a fleet. Therefore, you must track down the lowest cost insurers on the market to keep your expenses at a manageable level. You could try to do this manually and waste precious time or else you can simply browse through PrivateHireInsurance.net to quickly and effectively find the cheapest and most suitable insurance for your firm. We have gathered information from a select group of underwriters and once you enter your information, you can find the perfect insurer for your firm. Good luck!